Although the book of Philemon is a very short letter, it can be challenging to understand because it deals with slavery. Christians in the United States have a difficult time conceiving of slavery apart from the type of slavery that existed in the United States until the 1860s. Even though the slavery of first-century Rome was quite different, there is much that followers of Jesus in every time and culture can learn from this letter. I have written in the past about the evils of slavery, particularly the type of slavery that existed in the United States. The enslavement of African men, women, and children continued in American territories for over 270 years and has only been abolished for about 150 years. This evil has shaped our culture more than many of us would like to admit. Horrifyingly, there are also many forms of slavery that exist around the world today. It is estimated that there are around 40 million people who live in some form of slavery today. Thankfully, most modern Christians are rightly outraged by the slavery of the past and the present. When reading Paul’s letter to Philemon, we might wonder, why doesn’t Paul condemn slavery outright? Why doesn’t Paul rebuke Philemon for taking part in the evils of slavery? If you think it is because Paul doesn’t believe slavery is wrong, you need to read the letter again. I truly believe if the heart of this letter had been accepted by all those Europeans who claimed to be followers of Jesus, the African slave trade would have never existed! It’s easy to read Paul’s words, “I prefer to appeal to you” and “confident of your obedience” as being less than sincere. 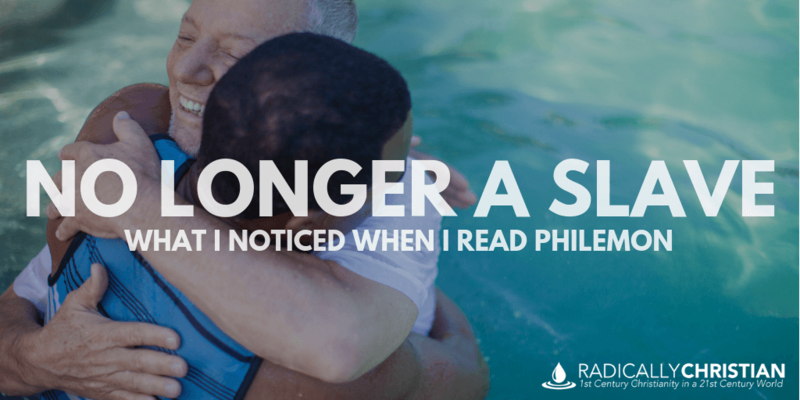 It’s easy to think Paul isn’t really confident Philemon will do the right thing. However, I choose to believe Paul is incredibly sincere and is exceedingly confident Philemon will do the right thing. This is a consistent theme throughout Paul’s letters, especially in his letters to Corinth. Paul wants followers of Jesus to voluntarily do good and be a blessing to others. Even though it is a Christian’s obligation to do so, Paul doesn’t want people to do good out of compulsion. He wants Christians to do what is right because they want to do it. He never wants to steal from someone the opportunity to choose the right path. I believe the most important theme of this letter is that faith in Jesus transforms relationships. Because of their shared faith in Jesus, Onesimus has been caring for Paul like a son would care for his aging father. And when Onesimus returns to the household from which he fled, the expectation is that he will no longer be treated as a slave, but will now be a family member. My favorite line is this, “Receive him as you would receive me.” Can you imagine how that would play out if it were truly obeyed? Onesimus was a runaway slave and Paul expects the Gospel of Jesus Christ to so transform his former master that he will receive Onesimus in the exact same way he would receive the apostle Paul. What might Philemon had done to receive Paul? Prepare a room for him, wash his feet, serve a feast in his honor, listen attentively to stories of his travels. In other words, Philemon would serve him, because that’s what a follower of Jesus is supposed to do. Followers of Jesus consider others to be more significant than themselves and serve them selflessly (Philippians 2:1-5). Paul expected Philemon to do this for Onesimus, serve him as he would serve any other honored guest in his home. And Onesiums, who at one time could not wait to get away from Philemon’s house, was returning to serve. He wasn’t returning to serve as a slave but returning to serve as a brother in Christ. What a beautiful picture: a former master and a former slave, now mutually submitting to one another and serving one another; each treating the other as if his brother was “more significant” than himself. Finally, I must say a word about Paul’s willingness to pay Onesimus’ debts. Paul wrote to Philemon, “If [Onesimus] has wronged you at all, or owes you anything, charge that to my account. I, Paul, write this with my own hand: I will repay it.” While making a sincere offer to pay any outstanding debt, he fully expected Philemon would probably refuse to accept Paul’s money because he himself felt indebted to Paul. This is what it looks like to follow the example of Jesus. Going to the cross, Jesus paid our debts in order to bring about reconciliation. Jesus was willing to say, on behalf of all those enslaved to sin, “Charge that to my account.” He did this to reconcile heaven and earth, bringing God and humanity back together. Jesus’ act of selfless love also brings about humanity’s reconciliation with each other. When we become followers of Jesus, we begin looking for opportunities to bring people together, even if we have to say, “Charge that to my account.” When two parties are at odds with one another, we seek to bring them together, even if the results of their misdeeds have to fall on us. Now that we are no longer slaves, we seek to free others from slavery. We seek to bring about peace and reconciliation in the world, even when we must follow in our Savior’s footsteps and have another’s debt charged to our account.